The BlueBird Jr safely anneals even large, exotic glass beads to prevent breakage during cooling. 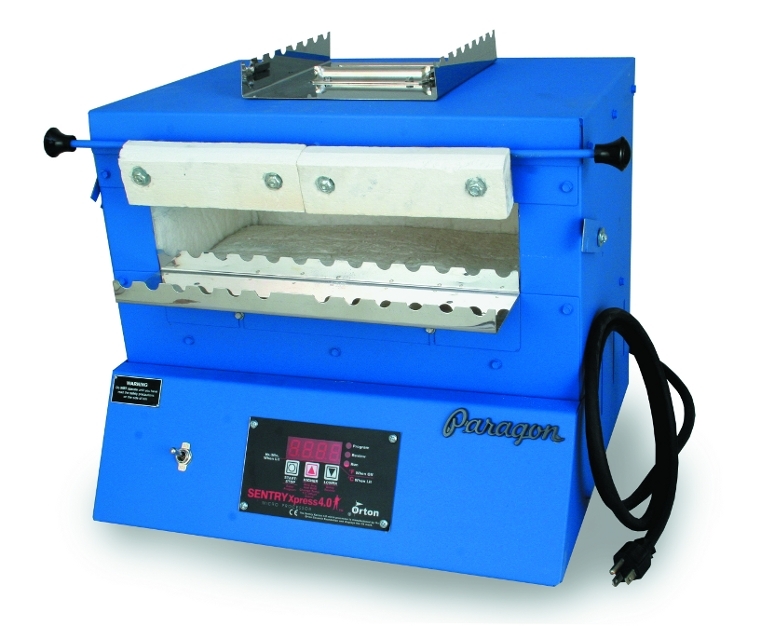 This innovative bead kiln is made in America to exacting standards. Weighing only 33 pounds (15 kilograms) out of the box, the BlueBird Jr is light enough to take with you on vacation or to seminars. It is ideal for traveling teachers with limited space. The kiln includes a handle on top for convenient carrying. Now you can be independent. Imagine taking the BlueBird Jr with you on exciting adventures. The BlueBird Jr features high-tech, efficient ceramic fiber insulation in the roof, walls and floor. The element is embedded in the roof between layers of ceramic fiber board to reduce dust. 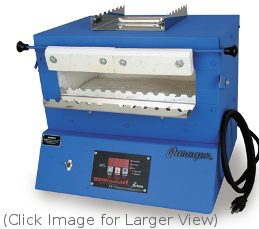 This is a true high performance kiln you will enjoy using often. Mounted on top of the BlueBird Jr with the carrying handle is a stainless steel glass rod warmer. Pre-heating glass rods saves production time. Side latches hold the doors closed while the kiln is heating to annealing temperature. Phenolic knobs stay cool to the touch. Rare-earth magnets hold the doors open when needed. Use the safety switch on the front panel to turn off power to the controller when the kiln is not in use. The BlueBird Jr plugs into a standard household outlet. It draws only 700 watts and is economical to fire. The kiln ships by convenient UPS. Specially designed cartons and vacuum-formed padding assure that the kiln will arrive safely. The BlueBird Jr has a durable high temperature, water-base finish. Water-base paint produces low emissions during spraying, which creates a safer working environment for our employees and cuts down on pollution. The BlueBird Jr's user-friendly 3-key Sentry Xpress digital controller automatically maintains the annealing temperature that you select. The controller is packed with features but is so easy to use that your child could program it. The kiln includes a Quick Start programming guide and a 16-page controller instruction manual, printed in color. Program the Temperature Alarm to sound when the kiln reaches a specific temperature. Program an alarm that will remind you to check the kiln.